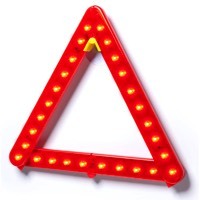 The BriteAngle LED Warning Triangle has revolutionised roadside safety, and is the highest quality, most reliable warning triangle available for all road users. Where conventional warning triangles depend on the headlights of oncoming traffic as well as the correct beam angle of those headlights to highlight a person’s whereabouts, the BriteAngle LED warning triangle does not leave safety to chance. Its LED powered lights can be seen from up to 300m away day or night, can withstand winds of up to 45mph and can be assembled in seconds. Also, with its built in switch mechanism road users will have peace of mind that the battery will not accidentally run out when in storage. The protective case doubles up as the triangle’s stand, and also has a storage compartment that contains a bracket and suction cup, so the triangle can be placed on the back of a lorry, van or motorhome as well as on the ground. Taking all that we have learnt through developing the BriteAngle LED Warning Triangle, we have designed a product specifically for motorcyclists, a significant gap in the road safety market. The MotoBrite fits directly onto the back of any motorcycle using a universal bracket that replaces the standard sized number plate. The number plate then fits onto the back of the MotoBrite’s waterproof case. 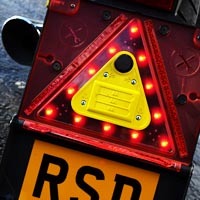 When the MotoBrite is in use, the case flips down to reveal high intensity LED lights as well as a copy of the number plate on the inside of the casing. 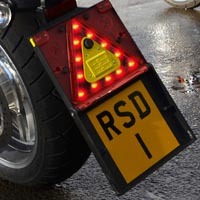 This slick design and simple usability means motorcyclists will be seen and safe when stopped on the roadside, but won’t have to compromise the overall aesthetics of their much loved motorcycle when riding. 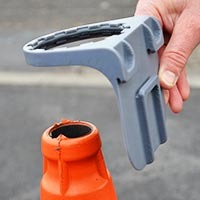 Following the popularity of our LED Warning Triangle among a variety of industry professionals, we decided to expand its usability even further by designing a unique bracket to attach the BriteAngle securely to the top of any standard traffic cone. 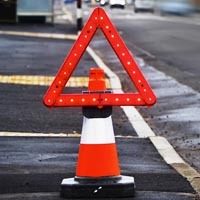 What the BriteAngle bracket means for any profession that involves working on the roadside, is that there is no longer a need to rely on a traffic cone’s reflective properties to illuminate a cordoned off area. 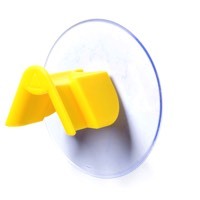 The mounted BritAngle will let road users know of your whereabouts from up to 300m away day or night, and the added height of the cone and bracket can combat the brow of a hill or any other potential hindrance to your visibility. The small yet sturdy design maximises usability as well as storage, and similar to the BriteAngle, can be assembled in seconds so you can deal with the task at hand knowing you are seen and safe. The ‘BriteAngle’ warning triangle is designed to promote safety by its proper use and does not guarantee that a collision will be avoided or physical injury from a road accident will not occur. Proper use of ‘BriteAngle’ is to place in a visible position in accordance with the road users legislation in the country of use. 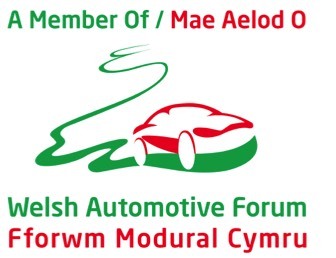 Following its application all vehicle occupants should vacate the vehicle and take up a safe position away from the road and traffic. Always store the ‘BriteAngle’ in the case provided, failure to do so may result in damage to the product and so affect its performance and condition.